ProCone offers different sizes of plant configuration. The most important factors are feedstock materials on a continuous basis, capital investment, and plant land availability. 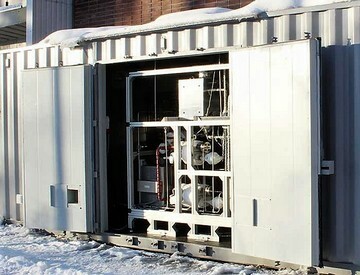 The smallest size is a container modular setup including feedstock material preparation, the gasifier, gas cleaning unit and the SynGas utilization unit producing electricity, liquids or other chemical materials. This setup is specifically tailored to projects that are starting out with a lesser quantity of feedstock materials and with an outlook to grow into a permanent facility. In addition, the program gives the owner the flexibility to move the containers to another location if not needed anymore at the original location. This container modular setup gives the owners the opportunity to locate the processing containers to where the feedstock is available and to move to another location, as required, or have it permanently installed in one location. The advantage of the container modular setup is not only the small footprint and front-up investment, it will also showcase the possibility of our technology to grow into a very economical, valuable, environmental conscious and socially acceptable solution of waste materials handling and management. Keeping the above mentioned factors in mind, the larger plants are without limits in size and scope. ProCone proposes larger projects to be built in phases as the economic risk is better mitigated. You can use our online 'Project Estimate Inquiry' form to get a conceptual estimate of your plant configuration.